Comet 67P/Churyumov-Gerasimenko captured by the Rosetta spacecraft March 14, 2015. A peculiar mix of molecular nitrogen on the comet target of Europe's Rosetta spacecraft may offer clues to the conditions that gave birth to the entire solar system. Molecular nitrogen was one of the key ingredients of the young solar system. Its detection in Comet 67P/Churyumov–Gerasimenko, which Rosetta is currently orbiting, suggests that the comet formed under low-temperature conditions (a requirement to keeping nitrogen as ice), according to officials with the European Space Agency. "Its detection is particularly important since molecular nitrogen is thought to have been the most common type of nitrogen available when the solar system was forming," ESA officials wrote in a statement. "In the colder outer regions, it likely provided the main source of nitrogen that was incorporated into the gas planets," ESA added. "It also dominates the dense atmosphere of Saturn's moon Titan and is present in the atmospheres and surface ices on Pluto and [on] Neptune's moon Triton." While nitrogen has been found on comets before, this is the first time it was detected by itself, as molecular nitrogen. Previously, nitrogen was detected inside compounds such as ammonia or hydrogen cyanide. Infographic portraying the first molecular nitrogen detection at Comet 67P/Churyumov–Gerasimenko. The Rosetta spacecraftdetected the molecular nitrogen using the probe's ROSINA instrument (Rosetta Orbiter Spectrometer for Ion and Neutral Analysis) between Oct. 17 and 23, 2014. At the time, Rosetta was orbiting just 6.2 miles (10 kilometers) from Comet 67P's center. Scientists said the unexpectedly low ratio resulted from the way ice is formed at extremely low temperatures. Perhaps the molecular nitrogen was trapped inside "cagelike" water-ice called clathrates, at temperatures between minus 418 Fahrenheit and minus 364 Fahrenheit (minus 250 Celsius and minus 220 Celsius), ESA said. Alternatively, scientists suggest the ice could have trapped the molecular nitrogen at a temperature of roughly minus 423 F (minus 253 C). This would make sense if 67P had been in the same region of the solar system as Triton and Pluto, which both have nitrogen in their ices. 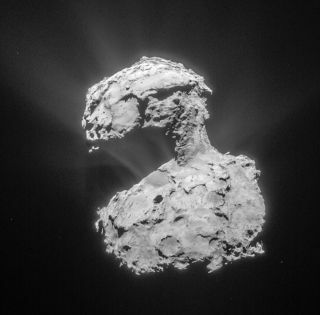 Regardless of the origin story, 67P would have released the nitrogen as it drew closer to the sun, which caused the comet's ice to melt. This could explain the low ratio, scientists said. The results were published in the journal Science and led by Martin Rubin, who is with the space research and planetary sciences division of the University of Bern in Switzerland.